The Best 21st Birthday Gifts, 21st Birthday Ideas. Memories are usually created by doing something out of the ordinary, out side of the normal comfort zone. Now I'm not suggesting for a minute that you sign up for a bungee jump, unless that floats your boat. But a day trip somewhere different would be memorable. How far could you get in a day? A surprise meet up with family or friends at the chosen location would make a wonderful and memorable gift. A trip to the theatre, coast, balloon ride or other unusual gift experience. The best 21st birthday ideas need a little planning. I remember a really memorable birthday of my brother's. We caught the train to the coast and all met together there, having a family day out at the beach. We played sumo wrestling on the beach, ate fish and chips and ice cream, followed by a roller coaster ride (that order of events not particularly recommended!). And talking of roller coasters, a day out at a theme park would make great ideas for a 21st birthday present. A group of friends, the size of the group would be budget dependant! Popular 21st birthday gift ideas in our family is a car. Not usually an expensive car! My cousin's first car was a VW beetle with a rainbow painted down the side. We went on a 2 week camping trip in that. 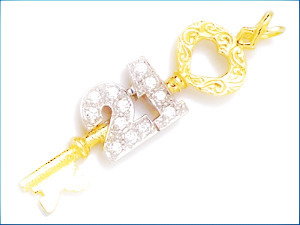 Buying tangible gifts for 21st birthday, will be treasured, and is a thoughtful way to make a milestone birthday special. I have to say that many of my birthday's have passed in complete oblivion! The one's I can remember have something 'attached' to them. Either a memory or something I still have (usually jewellery!). The 'Tarzon-o-gram' experience will be forever ingrained in my memory from my 21st birthday! The gold ear rings, the jade pendant given to me by my daughter. A venture in to my jewellery box is a reminisce into birthdays past. All these gifts given are close to my heart, chosen with thought and given with love. Every time I take them out and wear them I remember the special event on which they were given. So although you may think of jewellery as a clinched idea. I would think again. Buy the best you can afford. Jewellery really can be the best 21st birthday gifts.